Every girl is obsessed with her hairs. She spends hours in front of the mirror to get the perfect hairdo. This, I am talking about the normal days. What about special occasions? 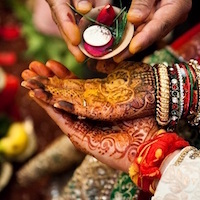 And more importantly, what about the most important day of her life, which is her marriage? Obviously, the hairstyle has got to be more than perfect on her D day. 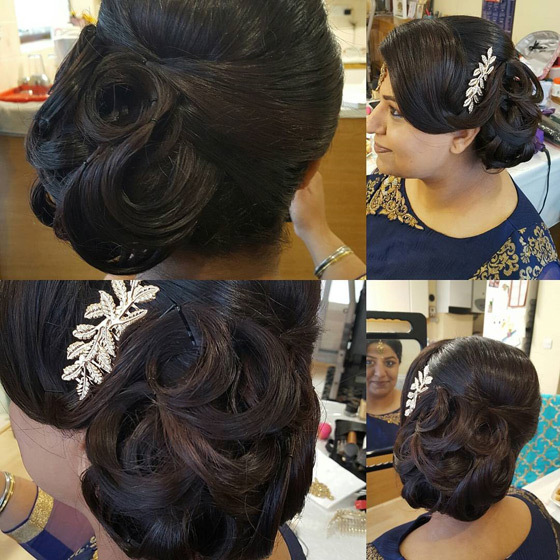 When it comes to stunning hairstyles, she is in a huge dilemma about what will be perfect for her perfect day. 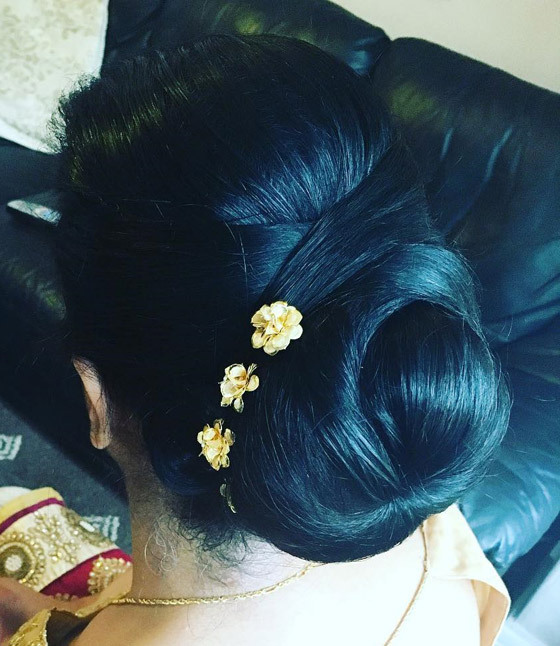 Simple and sleek bun will never go out of fashion for Indian weddings. This doughnut size bun will keep your hairs neatly in place so it can be worn under a ghunghat very elegantly. Add simple flowers to make it look prettier. Isn’t it amazing how a simple bump can convert a basic hairstyle into something so amazing? Here, a bumpit is inserted on the crown of the head with those beautiful loose curls coming down and the results are in front of you. 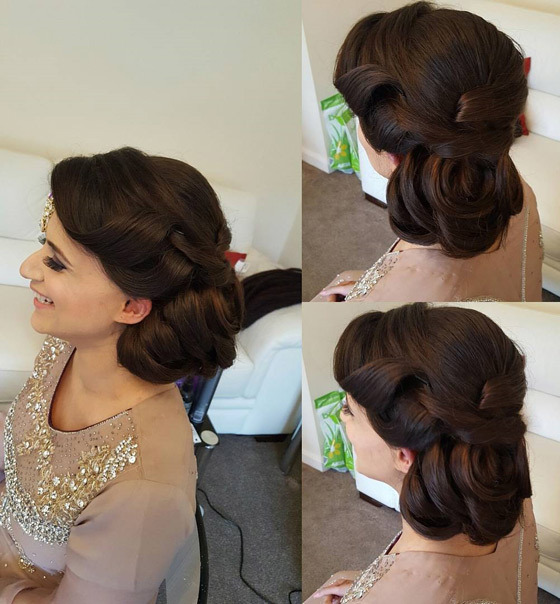 This wonderful hairstyle will make sure you look like a diva on your wedding day. If you have planned on ditching the classic red lehenga on your big day and have settled on something of a neutral tone than this elegant twisted side bun is a go-to for you. This classy twisted bun will keep things simple for you and will complement your lehenga beautifully. Dutch braids can make any simple hairstyle look something really very pretty. This gorgeous hair do starts with double Dutch braids in the front and ends with a juda or a fake juda in the back. A fake juda can help you get a full-bodied bun in case your hair lacks volume. As said, flowers are loved by every girl out there. 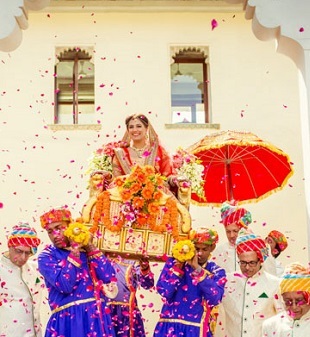 Flowers play a big role in Indian weddings. 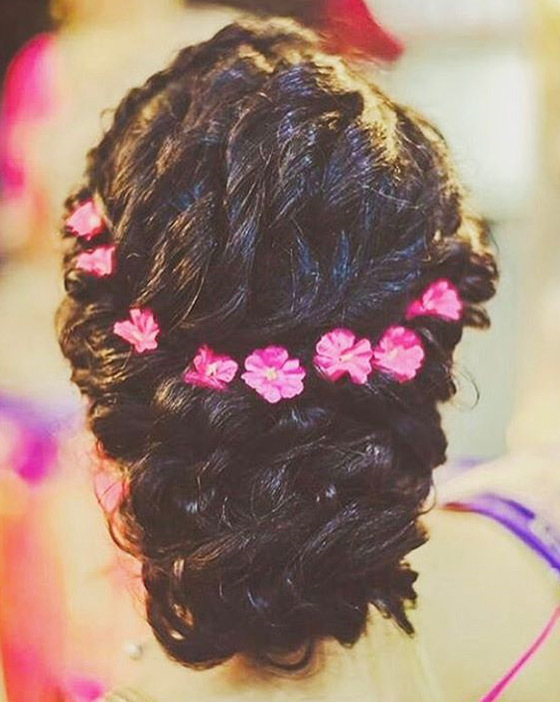 These beautiful braids with flowers in them look so amazing. I personally find it as one of the most stunning hairstyles. It can be worn on mehendi or haldi functions. Beautiful flowers increase the beauty of these braids and makes it look even more stunning. 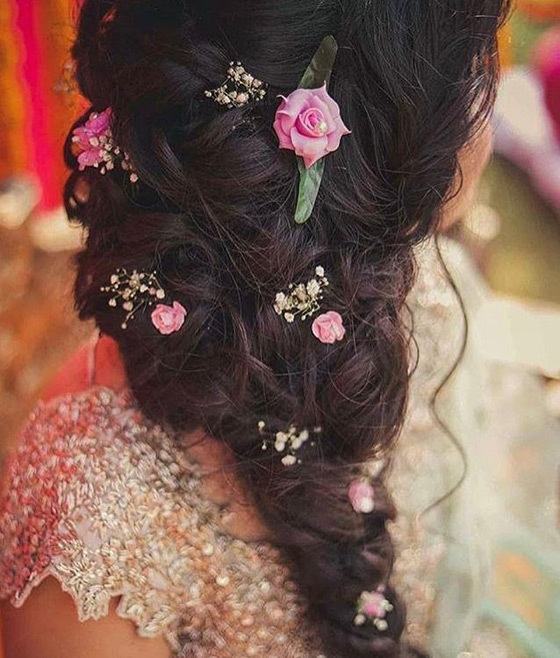 Flowers can either be real or fake ones but the look of the hair do will remain gorgeous as expected. Make sure to keep the braids a tat bit loose. The side partitions are kinda latest trend in India these days. These side parted buns look so stunning. 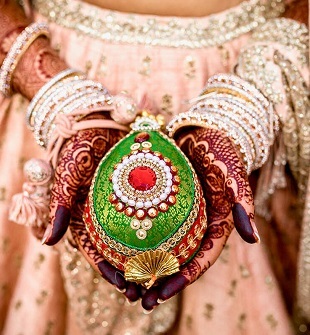 It will go so beautifully with your wedding lehenga. This beautiful ringlet bun has been decorated with a gold comb in a gorgeous leaf design to create a look inspired by nature. 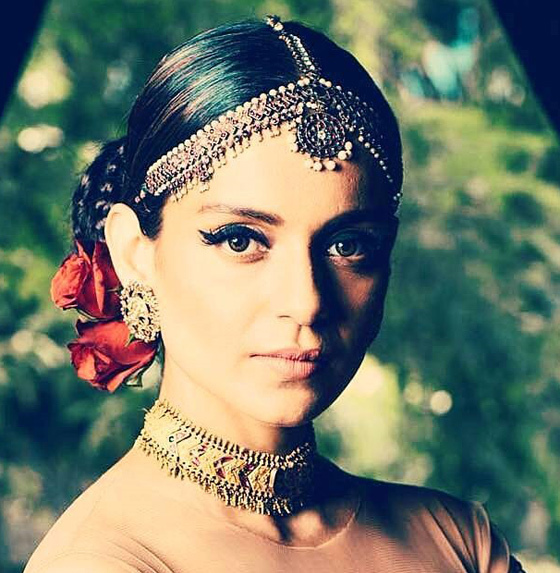 It will definitely make you look like a Bollywood diva on your big day. This beautiful french twisted bun will take you all along the super soft and romantic way. 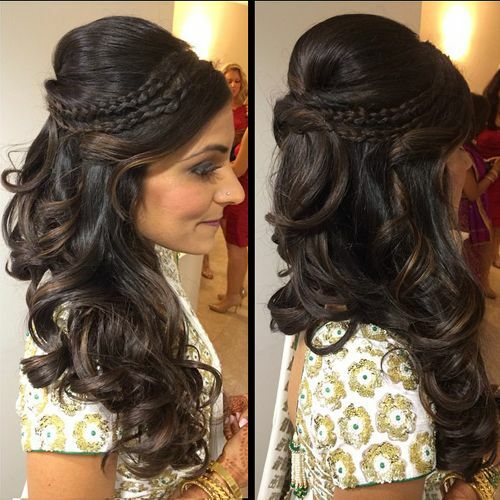 It is one of the most stunning hairstyles that a bride can wear. The curly French twisted bun looks so adorable and irresistibly sweet, thanks to the delicate flowers lining it at the top. This is the most underrated hairstyle. 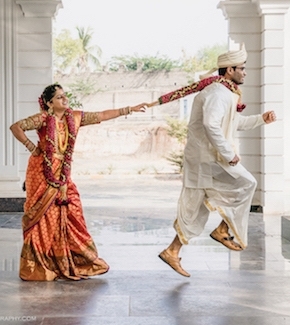 What could be better than a fusion of Indian and western? This beautiful braided bun accessorized with a couple of red roses, much like the breathtaking Senoritas in Spain looks amazingly beautiful. This is surely one of the most stunning hairstyles. 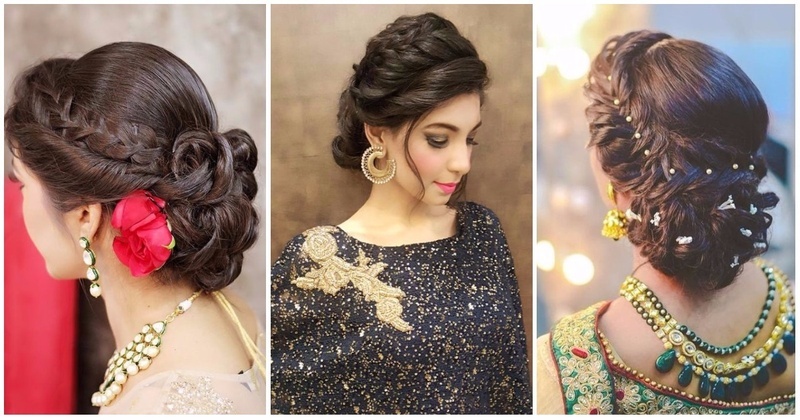 So we have seen these eight stunning hairstyles for a bride. Pick any of these according to your outfit.